The longest tennis match in history resumed this morning. 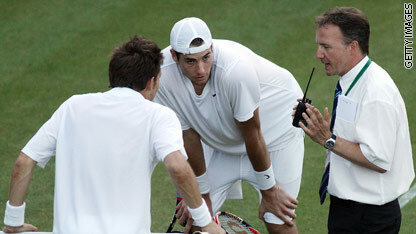 Wednesday evening Nicolas Mahut and John Isner finally got a break on the Wimbledon court when the sun went down. The two tennis players had been battling each other for the win for 10 hours. Wadler says the 10-hour match most likely took a heavy physical toll on the players' bodies. Their energy systems were being taxed to the fullest. Wadler says issues of judgment come into play, as well as concerns about dehydration and heatstroke. As a former doctor on tennis courts himself, he says he used to encourage players to use their change-overs to drink adequate fluids. And of course Wimbledon isn’t a match; it’s a tournament. Jack Stark, a sports physchologist works with NASCAR drivers, mixed martial arts fighters, wrestlers and basketball players, noted that the battle wasn't just physical. CNN Senior Medical Producer David S. Martin contributed to this report. Next entry »Why am I mixing up my words? Is this a learning disability? Tell it to the workers who labor all day to the point of exhaustion to feed their families and live paycheck to paycheck. They don't get dressed up in cute little outfits and sip tea with their pinky in the air after they're done. Wow! that was a really long and impressive match... but not what about the fans? we are no ready for that or all this emotions, I found this article about the world cup, check it out: http://www.mditv.com/blog/2010/06/22/warning-watching-the-world-cup-could-be-hazardous-to-your-heart/comment-page-1/#comment-1109. I was under the impression that this article discusses athletes playing a very physical game at a high level, and not outmoded elitism. It's the same with football. You need to be in peak physical condition, because you're running around constantly. Laboring? It's hard, and I hate to diminish the people who do it, but with the tremendous physical demands tennis has, I'd be surprised if either of these two players were able to lift a water bottle for the next week. more mentally exhausting than trying to watch the World Cup(oops, my bad, different type of exhausting, but not really, who cares?). Pat, the workers you speak of had the choice to be laborers and have families. Just like the tennis players did. No pity here.